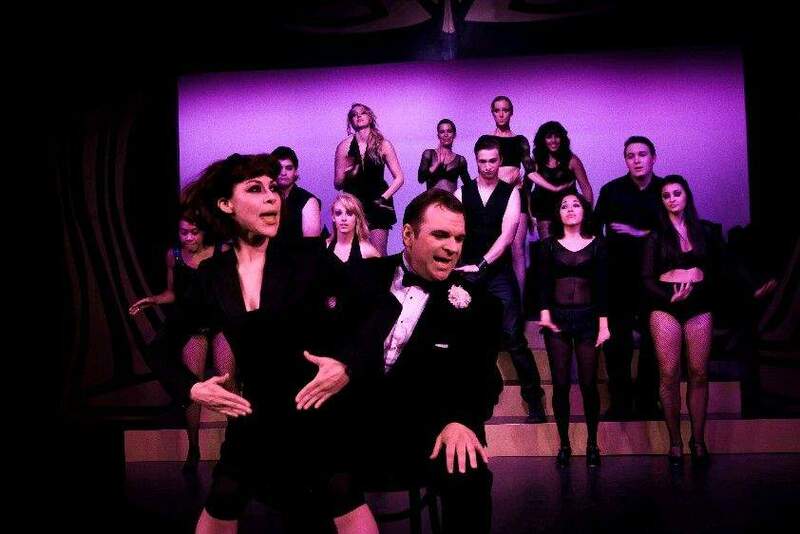 Marcelina Chavira as Roxie and Tim Moore as Billy Flynn take the lead in Thingamajig Theatre Co.s production of Chicago in Pagosa Springs. When Billy Flynn croons All I Care about is Love, hes suave, swell and all smiles. You know hes putting you on. Billy is the kingpin of the dark musical Chicago, the John Kander and Fred Ebb satire on American crime and its link to celebrity. Now playing in a stylish production at the Pagosa Springs Center for the Arts, Chicago has stellar leads, a disciplined cast and a clear vision of its cynical core. Chicago is based on a 1926 play by Chicago Tribune reporter Maurine Dallas Watkins. In the summer of 1924, she covered a string of murders by bitter women who were represented by a sleazy lawyer. In the midst of Prohibition, the murder spree gripped Chicago, and the link between crime and celebrity was promoted by the tabloids. In the process, the line between the criminal justice system and show business also got blurred. The stories became so popular that Watkins created a play centering around a fictional triangle: Attorney Billy Flynn and two of his questionable clients, Roxie Hart and Velma Kelly. Watkins also skewered her profession for its complicity. Her play opened on Broadway in 1926. The first film version came after in 1927. Fifty years after the murders, Kander, Ebb and choreographer Bob Fosse created a new American musical based on Watkins play. Making a hard left turn, Kander, Ebb and Fosse drove the American musical theater out of Oklahoma farmland and into gritty urban satire. The rest is theater and film history. Pagosas adroit actor-singer Tim Moore delivers a confident, fast-talking Billy. Hes ably joined by the effervescent Marcelina Chavira as Roxie Hart and the simmering, multi-talented Elyse Neubert as Velma Kelly. This manipulative triangle keeps the action going through Roxies arrest and trial, Velmas jealousy, Billys shifting attentions and one of the oddest happy endings in musical history. Director Laura Moore and Designer John Santangelo have paired down the work to its essentials. Played on a bare stage, the Pagosa interpretation reads appropriately as vaudeville entertainment. Costumer Jason Weiner simplifies the color palette by keeping all the players in black except for the sob-sister reporter, Mary Sunshine (vamped by Ammon Swofford) in smoky blue. Only a few white touches contrast: Billys jaunty carnation, his chorines feather fans and Amos crisp white shirt. Still, the production isnt perfect. The singing is uneven; the acting varies in intensity and focus. Last weekend, a few questionable flourishes or possible ad-libs interrupted the flow and pierced the silky texture. For example, does Mary Sunshine need to loudly trumpet an uncertain falsetto just for a laugh? That said, this is a complicated musical to stage. Some fans might wish for a live band, but the custom-made, recorded orchestration by Mitch Samu serves the company well. Its rich, textured and slightly sardonic. Listen for a snippet of Rock of Ages when Billy seeks to persuade a gullible jury. With our current celebrity culture booming, not to mention a summer crime wave in Chicago, this musical may be more relevant than we realize. Judith Reynolds is a Durango writer, artist and critic. Reach her at jreynolds@durangoherald.com. Thingamajig Theatre Co. presents Chicago, a musical by Kander and Ebb, Pagosa Springs Center for the Arts, 2313 Eagle Drive, directed by Laura Moore. Show times are 7 p.m. Wednesday through Saturday (no Saturdays in July) and 2 p.m. Sundays, through Aug. 12. Tickets cost $20 in advance, $25 at the door, available online at www.pagosacenter.org or by phone at 731-7469.